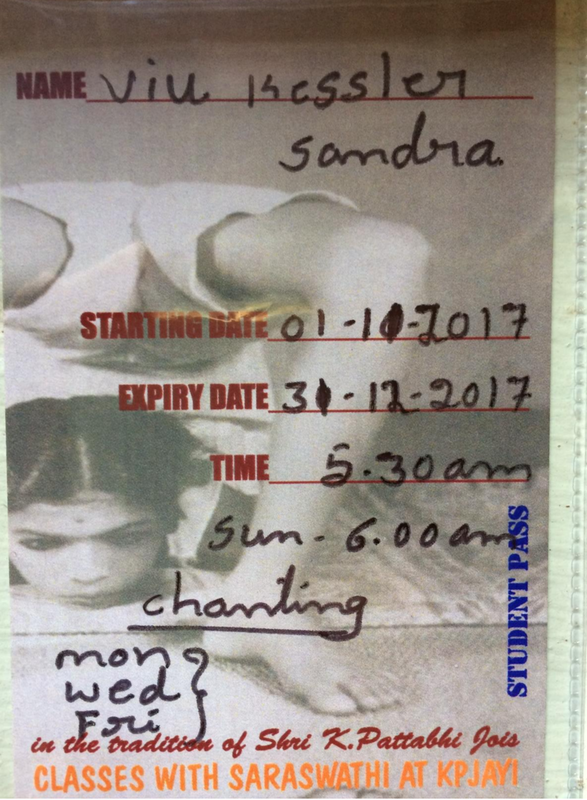 Yesterday I went for my registration to Sarawasthi Shala as the season for Sharat is fully booked. Practices are starting on November 1st, the full month will be in the main shala, then from December we will be moving to Sarawasthi Shala. I have changed my practice, adding more Pilates exercices before starting the Sun Salutation. Basically now I have added 30 minutes of Pilates before starting the Primary Series. First of all because I was in need of core centering as the practice itself does not give me enough strength, you might think that I am not practicing well, and that's okay I don't care ;-) and also since my injury I realised how much it was important to reinforce as well the gluteus. Also I have added Pasasana, Krounchasana, Salabasana A & B, Bhekasana, Dhanurasana, sometimes Parscha Dhanurasana and Ustrasana. Therefore am I following the "tradition" ? Not at all, when I am practicing the Mysore style on my own I do whatever I need in order to enhance my practice and I believe that I need to practice backbends in order to have better forward fold. I also believe that my injury has happened because of the repetition of the same movement, basically if you practice daily the Primary Series you are doing only (or a lot) of forward fold and when the injury is all about the hamstrings and the sit bone connection you soon realised that at one point you should stop the primary and work slightly differently. Of course for the next 2 months with Sarawasthi I will practice the way she wants but still will add at home exercices in order to protect my body.